To hear Part One of the interview, click here: CLICK HERE. To hear Part Two of the interview, click here: CLICK HERE. Derrick Bang, the film critic and former entertainment editor for the Davis Enterprise, once staged a life-sized Monopoly game around half of what is now Central Park. On the two latest “Davisville” radio shows, he talks about his career, the movies, his expanded blog, and where he’s headed next. Bang, who lives in Davis, has reviewed movies for the Aggie, Daily Democrat, Sacramento News and Review, and now the Enterprise since the mid 1970s. 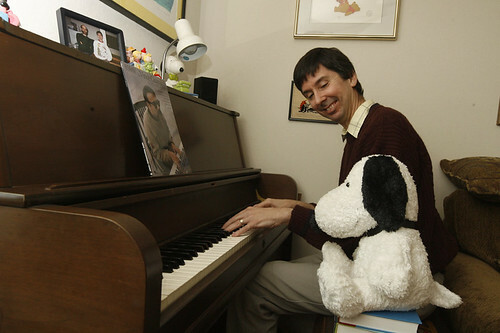 He also owned the now-closed Game Preserve store in downtown Davis, and has written books about Peanuts cartoonist Charles Schulz. The Enterprise, reacting to the weak market for newspapers and the poor economy in general, laid off Bang and three other employees this fall. “Davisville,” hosted by Bill Buchanan, airs Mondays at 5:30 p.m., Tuesdays at 4:30 p.m., and Wednesdays at 10:30 a.m. and 10:30 p.m. The interview with Bang will air in two parts: part 1 from Dec. 6 through Dec. 15, and part 2 from Dec. 20 through Dec. 29.